A resting oasis in Camerano, in the district of Ancona and a good departure point close to Ancona Sud exit toll. The Hotel La Perla, in Ancona, is strategically located Has A Strategic location, at 1km from Ancona Sud motorway exit toll. the Hotel is ideal to reach Camerano, Ancona, the surrounding industrial areas and the Conero Riviera, the restaurant is perfect for seafood cuisine gourmands. Close to the Hotel there is Camerano commercial area with IKEA, Decathlon and the best fashion outlets; besides to The Conero Riviera and the town of Camerano. The town hosts underground caves and in its territory starts the path of the Conero Red Wine. La Perla hotel, in Ancona, a brand-new building opened on 7th September 2013, includes bar, diner, restaurant and a 3 star hotel, whose design is entirely Made in Italy. It is entirely designed and made in Italy with the highest quality standards, selecting the artisans and the companies, who took care of the project realization and representing the condition of the contemporary Italian Design. The exclusivity of the design makes every item of this complex unique, non mass- production and collectible. Ancona & the Conero with all the comfort of our services! Conero & natureFrom the unpolluted white sand beaches to the more accessible and equipped ones of the seaside towns let yourself be amazed by the nature of the Conero Riviera. business travelAre you in business travel and in need of a break? 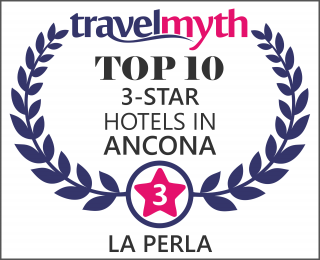 La Perla is hotel, restaurant, bar and diner, all close to the Ancona Sud A14 Motorway exit toll!